That was 2005. 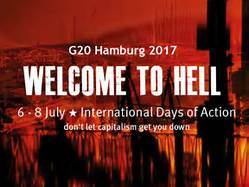 In the wake of the financial crisis and the polarised political upheaval of just the last few years, the demonstrations in Hamburg are even more important. They serve to illustrate there exists a powerful alternative both to neoliberal capitalism and to the right-wing populist nationalism that drapes itself in anti-establishment rhetoric – and steals the language of the leftThe international growth of the nationalist right – from UKIP in Britain to the Front National in France, the Trumps in the US, and Alternative für Deutschland in Germany – demands a cross-border response from the internationalist left. We offer solidarity across borders because we understand the problems of working class people in Scotland – austerity, climate change, racism – are common across Europe. We understand that a meaningful internationalism is about more than taking the “right” position on Brexit. We areoffering support and practical solidarity to those in Europe who broadly share our fundamental values, and we welcome all the solidarity that is offered in return.